News – All – SECTION CLOSED ON 31.12.2015. Belgrade, December 2015. A series of workshops, organized within the framework of the IX Adult Learning Festival, ended with a three-day workshop on advocacy. 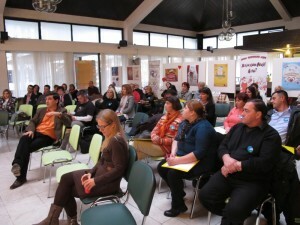 Adult Education Society prepared the training program prepared in cooperation with Foundation “Trag”, while Snežana Stojanović facilitated the training. The workshop held at the Centre for Culture and Sports “Šumice” and in the Adult Education Society, was attended by 20 representatives of 15 organizations that organize noncommercial learning activities in the community. The aim of the training was to improve knowledge and skills of participants to publicly advocate for community initiatives. They worked on specific examples, so that during the three days group developed basic elements of two projects of public advocacy: Opening of the first community learning center in Belgrade and Part of the Soko Society building return. Including the Festival central event and the preparatory partners meeting, this was the sixth meeting of partner organizations, which further strengthened the spirit of unity and partnership in this group of organizations. Next steps will include further development of the two projects and start of campaigns of advocacy in 2016. Belgrade, December 2015. At the annual meeting of the Association Humanas, with majority of votes it was decided that the Adult Education Society receives the call to join the Association. The Network “Humanas” is the largest national network of humanitarian organizations and associations dealing with elderly. 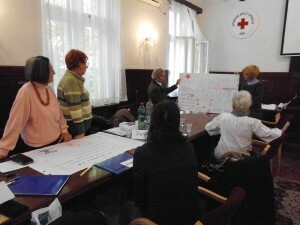 It was established at the initiative of the Red Cross of Serbia in 2004, and it’s members are also: Gerontological Society of Serbia, Caritas, DFSPC Philanthropy, Amity, Victoria, Swallow, Society for care of the elderly, the National Foundation for Humane Old Age, University of the Third Age, Circle of Serbian Sisters, Bread of Life, Association of pensioners… Given that lifelong learning is essential for a healthy and active aging Adult Education Society will make a significant contribution to the Network by providing expertise in the area of adult learning, and disseminate relevant information in this field at the European and global level. On the other hand, admission to the Network Humanas is the best confirmation for fifteen years of studious work in the field of third age learning, but also a huge responsibility in the future of the Society. Belgrade, December 2015. The emphasis of Adult Learning Festival in Serbia, since 2014 is on supporting learning in communities and their networking into the learning city. 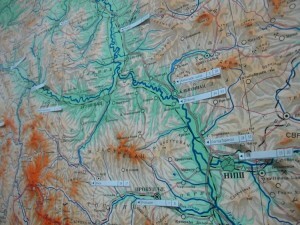 This original bottom-up concept is complementary with UNESCO’s Global Network of Learning Cities top-to-bottom concept. UNESCO initiative supports the practice of lifelong learning by promoting policy dialogue and peer learning among member cities. This Network forges links, fosters partnerships, provides capacity development, and develops tools and instruments to encourage and recognize progress achieved in realizing the vision of lifelong learning. Adult Learning Festival in Serbia, as the original model was presented at the 2nd International Conference on Learning Cities, held in Mexico City in October this year. A month later director of the UNESCO Institute for Lifelong Learning (UIL), Arne Karlsen, sent invitation letter to the mayor of Belgrade, Siniša Mali, for Belgrade to join the Global Network of Learning Cities. The efforts of the Adult Education Society in lifelong learning promotion, as well as cooperation with UIL are particularly emphasized in the letter. We sincerely hope that the city government will respond positively to this invitation and that City of Belgrade will, in this prestigious company, through exchanges with other cities, begin to improve conditions that lifelong learning give its full contribution to the development of Belgrade and the quality of life of its inhabitants. Brussels, December 2015. 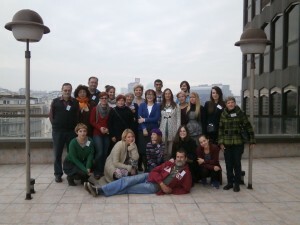 The final session of the ‘European e-training for Adult Educators’, organised by the AE-PRO project between May and December 2015, was held on 15th of December 2015. During the eight months of the training over 5,300 people registered to the AE-learning platform. The main aim of AE-PRO project is to create a learning platform and offer e-training about European developments and adult education European countries for adult education staff. “The popularity of the e-training surprised the project consortium. It shows that a European e-learning hub for adult educators was clearly needed,” says Policy Officer Tania Berman from the European Association for the Education of Adults (EAEA), the organisation behind the project. Juhani Pörtfors, a retired head of adult education centre from Finland, took the entire course. “My motivation to participate the AE-PRO e-training was to gain an understanding on European adult education in theoretical, political and practical levels,” he tells. 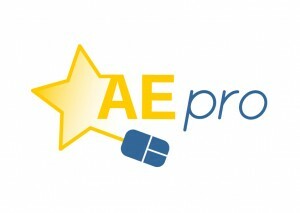 He found the AE-PRO e-training as a unique chance to communicate with other adult educators from around Europe. “I have realized that adult education structures vary in different countries but at the same time we have very much in common. It has been great to see that there are enlightened adult educators and active associations everywhere in Europe who are sincerely promoting the interests of the citizens.” The AE-PRO project consortium will organise a second e-training in 2016. More information will follow in February. The European Adult Education (Young) Professionals Learning Platform (AE-PRO) project offers a capacity building e-training for (younger) staff in adult education about European developments and adult education in other countries. We aim to increase the knowledge of staff about adult education in Europe and increase the exchange of innovation across Europe through intergenerational learning, and the learning of experts as well as peers. We also aim to provide opportunities for the professional development and training of staff in adult education through the coordinated use of Erasmus+ mobilities. Ljubljana, December 2015. Slovenian Institute for Adult Education in cooperation with the Slovenian Andragogical Association, Association of Providers in Education and Centre of the Republic of Slovenia for Mobility and European Education Programs organized in Ljubljana in the period 7-8.12.2015 a regional conference “Building Bridges in Adult Education”. Adult Education Society (AES) as a contact organization from Serbia was invited to bring together relevant partners in Serbia and organize their arrival. Apart representative of AES Serbian delegation consisted of representatives of Group of Andragogy, Faculty of Philosophy in Belgrade, Serbian Association of Andragogists and Ministry of Education, Science and Technological Development. Bosnia and Herzegovina, Montenegro, Croatian, Kosovo and Macedonia, also sent delegations with representatives of all relevant institutions and organizations. After the conference “Quality in Adult Education and Staff Professionalization” in Budva in November 2014, this is the first regional conference, which brought together this broad group of national representatives and allow to exchange experiences and to compare the current state of adult education in the region and seek opportunities for networking and cooperation. The first day of the conference was devoted to the presentation of the situation in the region, and on the second day, through the work of the thematic working groups, further analysis of experiences and activities related to specific topics and areas were organized. As an example of good practice conference participants visited Culinary and Tourism Centre KULT316, of the Biotechnical Educational Centre of Ljubljana. Although the meeting had no thematic focus, thus no concrete agreements and results could be expected, a high level of enthusiasm and very positive energy marked the whole event and all participants agreed that such a gathering should become common practice. In this regard, the decision was made right at the meeting that our region will continue to build bridges in adult education next summer, 2016 in Mostar, Bosnia and Herzegovina. Belgrade, December 2015. The final ceremony of the IX Adult Learning Festival is organized in ImpactHUB in Belgrade on December 3rd, 2015. 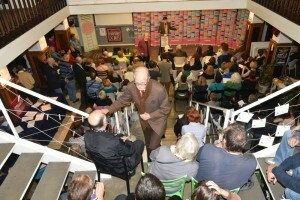 This year the Festival is organized under the motto “Everyone can learn everything he wants and everyone can teach.” During the Festival, numerous visitors had the opportunity to introduce different organizers of non-profit learning activities in Belgrade, through the introductory presentation, the collage film about learning in the community, and then through workshops organized at the event. It was an opportunity to experience the learning through psychological workshops, poetry workshops, studio photography, dance studio, workshop organic farming, decoupage, drawing on canvas … After this session, the idea of Community Learning Centre was presented, and then during a cocktail visitors had a chance to create their own Community Learning Centre, in accordance with their wishes and needs, but also in accordance with their abilities and talents, because the idea of the Community Learning Centre it based on resources in the community. The results of these activities will be analysed and used for the design of the development strategy of the first Community Learning Centre in Belgrade, which will be organized on a workshop that will be held in late December. IX Adult Learning Festival is closed with magnificent, intergenerational performance of two choirs. The choir of Elementary school “Drinka Pavlović” and the choir of Gerontology Daily centre “Aging Forbidden!” jointly sang several songs including the EKV’s song “This is the country for us”. One of the key indicators about the need for Community Learning Centre in Belgrade is presence of more than 250 people in the Festival closing ceremony. Belgrade, December 2015. In the Media Center Belgrade the press conference was organized on the occasion of the central ceremony of IX Adult Learning Festival in Belgrade. Adult Education Society announced the ceremony and presented a new concept for learning in community. The initiatives that AES starts with network of partner organizations. The Festival program, partners and interactive educational programs were presented to journalists. Beside the journalists the conference also attended the representatives of the Education Center of the Serbian Chamber of Commerce and Industry and they have declared willingness to cooperate and participate in the work of the Community Learning Centre. Belgrade, December 2015. Adult Education Society, for the second year in a row, supported programme of Functional Elementary Education of Adults (FEEA) in Serbia. In Jun AES has offered the Ministry of Education, Science and Technological Development support to programme worth € 10,000, assuming that according to the program needs, additional training for teachers will be organized. By the end of the year still no conditions for the organization of additional training existed, therefore it was decided to support the FEEA programme through the donation of the manuals for students. There is still no mechanism for providing these manuals for schools, and since these are the only material for programme participants the manuals are prerequisite for successful implementation of the programme. Nearly 60 schools were contacted and 38 of them sent requests. AES responded positively on all request and manuals were printed and distributed to larger centres. With this year’s donation 2160 participants of the program FEEA were supported. Belgrade, November 2015. Adult Education Society participated in preparation and organization of the expert meeting “Innovative methods and programs in the field of daily community services for the elderly” The event was hosted by Gerontology Centre Belgrade, and held in elderly house “Bežanijska kosa” in Belgrade on 30th of November. The manifestation was organized for social workers employed in gerontology centres in Serbia with the aim to present innovative methods and programs in the field of daily community services for seniors. The Gerontology Centre Belgrade, one of the key partners for Community Learning Centre initiative, recognized the significance of the education and learning of seniors and invited AES to supplement the content of the event and assist in its implementation. AES’s associates presented in three working sessions a theoretical framework for understanding elderly learning and education. Then the participants were shown a video collage about community learning with examples of good practice. A special session was dedicated to interactive workshop about possible design of the Centre for Community Learning. After summarizing and presenting the workshop results participants were encouraged to launch initiatives by short movie on self-sustained learning community from the United States, but also by discussion and exchange of experience. Lisbon, November 2015. The 4th AE-PRO partner meeting was organized in Lisbon on 26th and 27th of November by partner organization from Portugal, Kerigma. 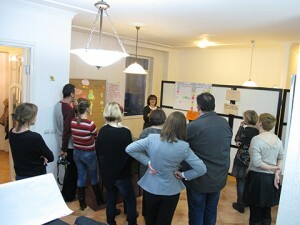 The working day started with an open discussion about partner’s experiences on running the webinars. Furthermore, the results and the main outcomes of the project were presented. The first AE-PRO e-training was conducted between May and December 2015 and over 5300 adult education professionals have registered as users to the platform. Bearing on mind that the last session for this e-training will be organized on 15th of December on the meeting the partners talk about the future and the second e-training which will be organized in 2016. Representatives of Adult Education Society (AES) presented the general results of the participant’s evaluation of the sessions. For this report also was used participant’s self-reflections about learning process within each session and data that platform collected automatically about users. Also, the decisions about final evaluation were made and responsibilities for the next year defined. Bor, November 2015. The closing ceremony of the IX Adult Learning Festival in Bor was organized in The National Library Bor. This year all activities were dedicated to starting and supporting the learning initiatives in the community. Framework program of adult education activities in Bor municipality 2016 was presented. The New Age Movement, Association of Young Researchers Bor, National Library Bor and Reading Room Europe have been recognized as the key stakeholders for establishing community learning initiatives. The IX Adult Learning Festival was a great chance for the festive certificate award. The participants that successfully finished the program for the web journalists got the certificates. Furthermore, the partners that attended the cycle of Adult Education Society capacity building trainings for starting the Community Learning Centre, received the certificates as well. In the end of the ceremony the coordinating working group for promotion and lobbing for Community Learning Centres was introduced to the audience and local media representatives. Belgrade, November 2015. The delegate of Adult Education Society participated in conference about intergenerational solidarity “Bridging the gap” on 12th of November. 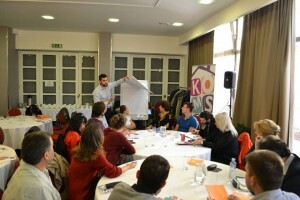 The event was organized by the Umbrella organization of Serbian youths in cooperation with UNFPA and UNDESA. The conference aim dedicated to discussing and rethinking the key questions for promoting culture of dialogue, responsibility and intergenerational cooperation. In the first part the organizers, delegates from respected ministries, research institutions, NGOs presented their views about the topic. The representative of the Adult Education Society in the discussion mentioned the lifelong learning related goals of the Ageing Strategy for period 2006-2015 and open discussion about the new strategies steps. In the continuation the good practice examples were presented. Furthermore, the participants divided into two groups worked on recommendations about intergenerational cooperation in the three fields: employability, political engagement, and existing stereotypes. Finally, during the discussion many connections between individuals, as well as organizations was made. The next step is working together on project proposals. Belgrade, November 2015. Last training for supporting community learning initiatives, organized by Adult Education Society as part of preparation for the IX Adult Learning Festival, is held in the Office for Youth “Nest” in the period 13.-14.11.2015. The training “Creation and implementation of educational programs” was attended by 18 representatives of various learning initiatives in the community, from small informal groups, through NGOs to institutions. The training was conducted by collaborators from Department of Andragogy, Faculty of Philosophy in Belgrade: Tamara Nikolic Maksic and Aleksandar Bulajic. The aim of the training was to improve the competencies for the design and implementation of educational programs for adults. Since each of these organizations have learning activities, participants said they got valuable knowledge, necessary for their future work, as well as interest in continued cooperation. Belgrade, November 2015. Adult Education Society organized the webinar Applied theatre methods in adult education: legislative theatre in prison on 10th of November within EU project The European Adult Education (Young) Professionals Learning Platform (AE-PRO). 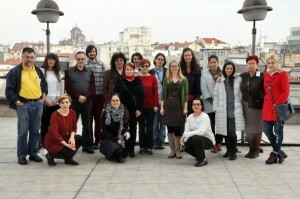 Tamara Nikolić Maksić, Ph.D. Assistant Professor at Adult Education Department, Faculty of Philosophy University of Belgrade, gave the lecture and made the concept for one week session at the AE-PRO educational platform (http://www.ae-learning.eu/course/view.php?id=64). 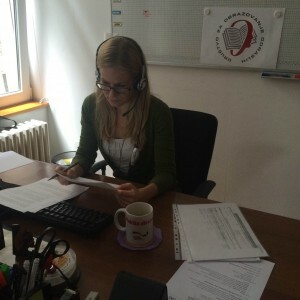 Nikola Koruga, Adult Education Society project manager, had the role of producer during the webinar. The overall goal of this session was to inform adult educators about the potentials of applied theatre and the benefits of using interactive methods and drama techniques in educational setting, with an emphasis on legislative theatre and prison drama in penitentiary institutions. In addition, participants have opportunity to become familiar with some practical theatre techniques and try to use some of them during the webinar through proposed tasks. Belgrade, November 2015. Adult Education Society organized the second, of three trainings to support community learning initiatives, in preparation of IX Adult Learning Festival, in period 7.-8. November 2015. The training „Active Local Community“ organized in the Office for youth “Nest” was attended by 23 representatives of various community learning initiatives, from small informal groups, through NGOs to institutions. Adult Education Society prepared training programme in cooperation with Foundation Trag, and facilitated by trainers Snežana Stojanović and Sonja Todorovic. The aim of the training was to improve knowledge and skills of participants to organize activities in community, to mobilize community members and to fundraise in community. The positive working atmosphere and a very dynamic work was crowned in the end of the training with high grades of participants. Belgrade, November 2015. Adult Education Society organized the webinar Situational barriers and learning abilities of functionally illiterate individuals participating in programmes of elementary adult education in Serbia on 3rd of November within EU project The European Adult Education (Young) Professionals Learning Platform (AE-PRO). 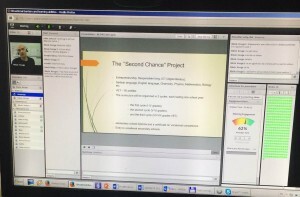 Nikola Koruga, project manager from Adult Education Society, had the role of producer during the webinar. Aleksandar Bulajić, MPhil Research and Lecturer Assistant at Faculty of Philosophy Belgrade, Department for Andragogy, gave the lecture and made concept for one week session at the AE-PRO educational platform (http://www.ae-learning.eu/course/view.php?id=65). The overall goal of the session is familiarising participants, all around Europe, with key issues concerning the situational barriers and cognitive functioning characteristics of illiterate adults undergoing a process of elementary adult education. 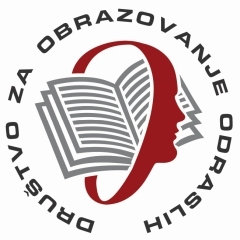 In addition, participants have opportunity to become familiar with Serbian model of Functional Elementary Education for Adults and researches in the field of working memory. Belgrade, October 2015. In the premises of the Retirement home “Bežanijska Kosa”, of the Belgrade Gerontology Centre (BGC), in the period October 19-20, 2015, a training “Creation and facilitation of programs for the elderly” have been organized. The training, organized by the Adult Education Society (AES) and BGC as part of preparatory activities of the IX Adult Learning Festival, aimed to support employees in gerontology institutions to independently create and facilitate educational programs for elderly. 23 experts working within BGC participated in the training: social workers, psychologists, occupational therapists, etc. AES engaged trainers (Aleksandar Bulajic, MA and Tamara Nikolic Maksić, Ph.D.) from Department of Andragogy, Faculty of Philosophy University of Belgrade, and training program is specifically developed for this occasion with the support of Mrs. Svetlana Živanić, adviser in the State Institute for Social Welfare and head of the 3rd Age University Network, for many years. The vast experience of the group in working with the elderly was good starting point for discussions about application of presented andragogical concepts in the sphere of work with the elderly, that followed each thematic session. The quality of the obtained recommendations and information from the group was such that trainers recognized it as an important source of information and insight to further develop training for professionals working with elderly. Zlatibor, October 2015. The fourth Regional exchange of experiences of trainers in adult education was organized in cooperation of Adult Education Society and DVV International, Office in Sarajevo. The meeting was held at Zlatibor Mountain, in Hotel“Ratko Mitrović” for 20 participants (10 from each countries). The training realised during the two working days. The topics were proposed by participants and two sessions were led by external trainer Tiffany Joy Ross, the actress from USA, who lives in Belgrade. This time the visits hadn’t been included into the program. The content of the training was adapt to the needs of participants and current challenges in adult education, like refugee crisis. The session Intersectionality and the role of education in deconstruction of privileges tended to move the trainers focus on the position of the unprivileged groups and their position in adult education. The session about conflict resolution models introduce participants how to solve the conflict situations. Self-education was the important topic for establishing community learning initiatives, which can immediately react on educational needs. 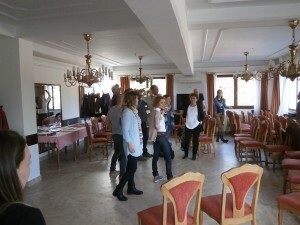 At the end of the training the five possibilities for closing the learning and group processes was introduced. 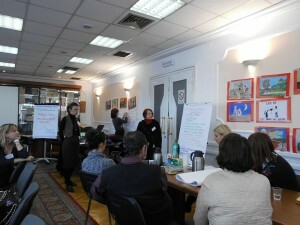 The trainers were encouraged to test a new approaches and do group and individual reflections on their work. The rich discussion and active participation had shown that the training fulfil high expectations set up by previous trainings. Finally, the evaluation clearly shown that there is a need for continuation of this kind of exchange.